Data Entry Tools -- Are you getting the most out of DonorSnap? We've already covered several categories of DonorSnap tools that you may not have explored yet including data cleanup, reporting, and email tools. In this issue we'll take a deeper look at some of the awesome ways to add new data to your database. If you've just got a couple of random donations to add, stick with the normal manual entry. But let's say you just completed an event and have a stack of checks from it, or you just sent out a mass mailing for your year end appeal and want to record it... manual entry would become a little tedious. 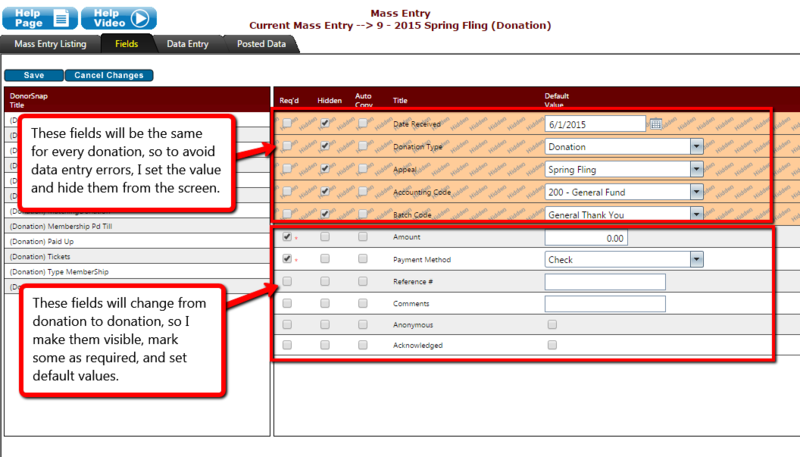 I'll walk you through two data entry tools in this issue: Mass Entry and Interaction Mass Update. Each of these tools has their place for almost every organization. Keep reading to learn how to use them. If you haven't used the Mass Entry tool yet, be warned... it's really awesome! Sure, manual entry is great and all, but when you see how much time you can save and how much more accurate your data entry will be, you will probably try to use this tool exclusively. The way it works is that you first select which fields you want available in your data entry form. All irrelevant fields don't even need to show up. Next you can set defaults for any of those fields so that you don't have to select the same value over and over. If you know for certain that all of the donations you are entering at the moment will have the same campaign code, you could set the value and then mark it as hidden. That way you can't unintentionally change it to something else. Once you have the entry form set up how you want, your settings will be saved. You can come back (or direct volunteers to it) and use this mass entry form whenever you need to. Flip to the Data Entry tab, and with a couple of clicks and keystrokes you will have selected the contact, changed the unique details for their gift, and added it to the pending records. Once you are ready to post those records to your live database, simply click the "Post" button. That's all there is to it! This is a great way to use volunteers for accurate data entry without letting them see the rest of your database. Give it a try today and explore all of the ways it could be useful for your organization. Want to see a video of Mass Entry in action? Watch the Mass Entry training webinar. To be honest, this tool by itself is probably more beginner than Mass Entry, but since it requires the use of DataMiner Platinum, we'll call it intermediate. 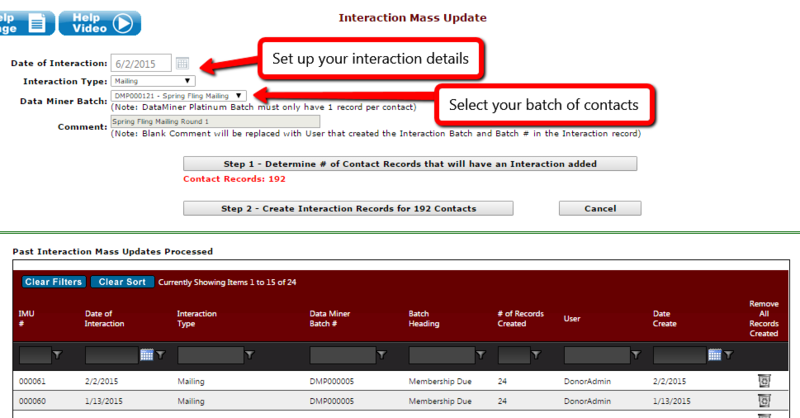 Interaction Mass Update is a great way to finish up a mass mailing. For your mailing, you probably already created a DataMiner Platinum list to select the contacts that you wanted to send your mailing to. All you have to do now is select that DMP list from the dropdown and fill in the fields for your interaction record. The screenshot below shows how simple it is. Interested in learning more? Check out the Interaction Mass Update training video. In the next issue we'll cover Excel Import. Learn how to import new contacts, add donations and records to existing or new contacts, and update existing contact information from an Excel spreadsheet. DonorSnap is now offering a free training almost every week. The free trainings take place on Wednesday afternoons and the topics range from Getting Started with DonorSnap to advanced features like DataMiner Platinum and Online Forms. The next 4 trainings can be viewed at any time. Space is limited so Register Now. Want to Watch a Past Training? Each of our weekly trainings are recorded and placed on the DonorSnap Help Site. These trainings are generally available a few hours after the training ends. See all of the other past trainings on the help site under Training Webinars.